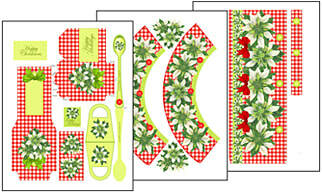 Poinsettia Crafts with white Poinsettias in stead of the traditional Swiss Edelweiss blooming on ginghams and braids have a distinct Alpine look! Super Christmas Crafts and popular at Craft Fairs. 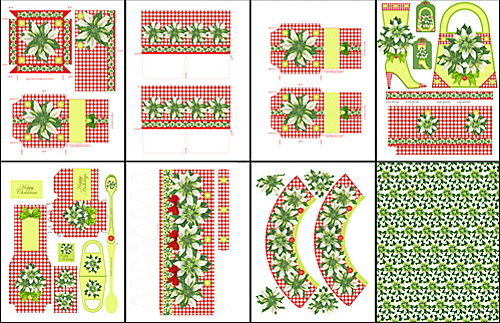 This range, with its white Poinsettias, is teamed with buttons and red and white gingham for a pretty country-folksy style. 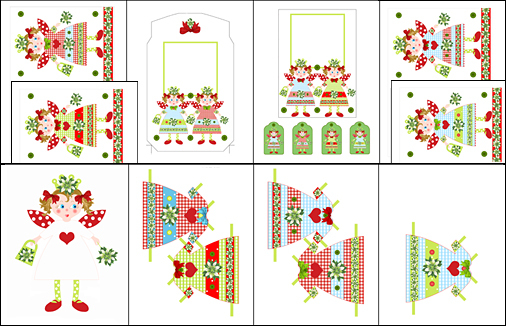 The combo has ALL the printable craft sets including the Christmas fairy sets. ​Lots of practical 3D paper crafts and handmade card designs. The combo has 60 Pages of crafts! The 3D Cup and Teacup Cradle Card are INCLUDED in the combo! 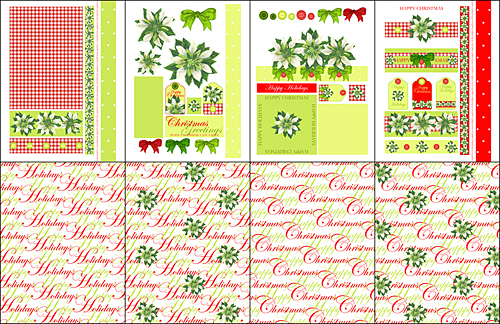 Christmas Poinsettia 3D Cup set. 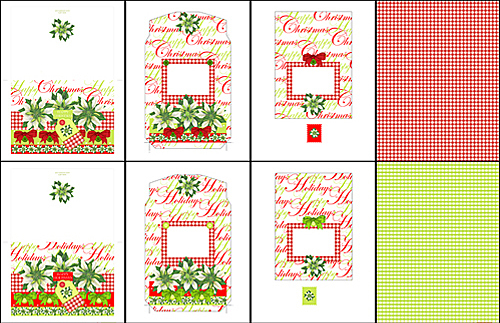 A cluster of Poinsettias on a lime bag front and a folksy Alpine gingham front make two distinct gift packs for a variety of gifts. Add in tissue paper if you please. Handbag fronts and backs can be combined in different ways: The plain lime and plain gingham bag backs can also be printed twice for plain bags to decorate as you please. 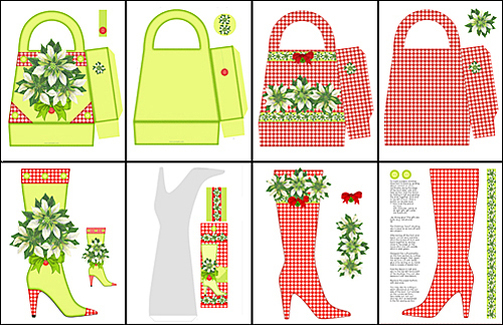 A Poinsettia boot front and a folksy Alpine gingham front can combine with either a gingham back for stockings to hang up, or a card back for a huge lifelike stand-up boot card. Add small gifts to the paper stocking. The units can also be printed on iron-off paper and ironed to fabric to sew. The plain gingham back can also be used for a plain boot to decorate as you please. Two cards that are ready for quick point and print creations. The one card and envelope set has Happy Holidays sentiments and the other reads Happy Christmas plus envelopes with seperate fronts and backs. The card kit offers scope for unique card combinations. Both Happy Christmas and Happy Holiday sentiments are included in elements. The tea box with packets for stacked tea bags make a perfect little gift. At least six tea bags in their packets fit in the box. A single packet can be used as small envelope for the gift card too. • BONUS dress as thanks from Christmas Fairy! See blank templates perfect for extra paper crafts and packaging in the Funpacks and Favor collections! Crafts galore featuring the beloved Poinsettia in a fresh new look! The card kit offers scope for unique card combinations. Both Happy Christmas and Happy Holiday sentiments are included. The two 5x7" cards that are ready for quick point and print creations have envelopes too. The tea box with packets for stacked tea bags makes a perfect little gift. A bag front, as well as stocking front with a cluster of Poinsettias and ones with a folksy Alpine gingham front make two distinct gift packs or stockings for a variety of gifts. Fronts and backs can be combined in different ways: The plain lime and plain gingham backs can also be printed twice for plain bags or stockings to decorate as you please. A Ponsettia boot front and a folksy Alpine gingham front forms a stocking to hang up, or a huge lifelike stand-up boot card. Add small gifts to the paper stocking. The units can also be printed on iron-off paper and ironed to fabric to sew. The Anni Arts mug with its "Latte" spoon, gift card envelope and tea bag packet makes a highly unusual container for a purchased gift card (or small gift) with the realistic tea bag and tag hanging out. You can finish the mug-and-treat scene by adding a few cupcakes in their wrappers or use separately.